Crystal Palace continued their excellent start to the season with a comfortable victory over West Brom. Yannick Bolasie opened the scoring midway through the second half when he headed home Yohan Cabaye's inviting curling cross. Cabaye added the second from the spot after Wilfried Zaha, a constant menace on the right wing for Alan Pardew's side, was tripped by Chris Brunt. The defeat was West Brom's first away league loss of the season. Palace, meanwhile, climb to third, a point behind leaders Manchester United. West Brom came into the match as the only team in the Premier League yet to concede an away goal. But when Zaha burst past left-back Brunt and fired just wide after seven minutes, it became clear Tony Pulis's side would have their work cut out to preserve that record. Their task was made more difficult when centre-back Jonny Evans limped off midway through the first half, forcing West Brom into a defensive reorganisation for the second match running. From that point onward, the visitors' primary ambition seemed to be to add to their tally of 14 clean sheets in 2015 - the best total in the league - but they were undone with just over 20 minutes to go. 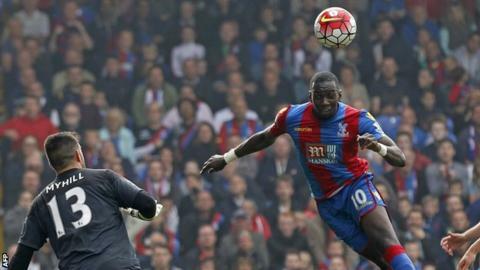 Bolasie headed past Boaz Myhill from close range to register his first goal at Selhurst Park since New Year's Day 2013 - 46 home games ago. Pardew publicly criticised Zaha last month and dropped him to the bench for last week's win over Watford, but that move paid dividends as a rejuvenated Zaha turned in an inspired performance. The one-cap England international was the game's outstanding player with his direct running and it was fitting that he should create the second goal for the hosts. He ran at Brunt once again and, having surged into the penalty box, knocked the ball ahead as the Northern Irishman lunged in. It was the second penalty Zaha had won in as many matches, and when the reliable Cabaye stepped up, the result was the same as in the match against Watford. Victory at home was a relief for the Eagles, who had lost six of their past eight league matches at Selhurst Park. Crystal Palace manager Alan Pardew: "We were very, very good. It was a great performance. Wilfried Zaha can beat players and when you have players like that in your side it gives you great creativity. "Wilf was on the end of some fantastic passing from Puncheon and Cabaye, which he exploited. I was really pleased to get that second goal, because it just gives you the rubber stamp on that performance. "We've got ourselves in a great position and if the players come back fit and well from the international break there's no reason we can't keep putting in performances like that. I can compare this team to the team I had at Newcastle when we finished fifth." West Brom manager Tony Pulis: "You can't believe it was the same team that played against Aston Villa, they played so well there and this performance was like chalk and cheese. "They were much better than us. Saido was one of a number of players who didn't play near the level they are capable of." After the international break, Palace host West Ham on Saturday, 17 October, while West Brom play Sunderland on the same day. Match ends, Crystal Palace 2, West Bromwich Albion 0. Second Half ends, Crystal Palace 2, West Bromwich Albion 0. Attempt saved. Callum McManaman (West Bromwich Albion) right footed shot from the left side of the box is saved in the top left corner. Substitution, Crystal Palace. Joe Ledley replaces Wilfried Zaha. Goal! Crystal Palace 2, West Bromwich Albion 0. Yohan Cabaye (Crystal Palace) converts the penalty with a right footed shot to the top right corner. Penalty conceded by Chris Brunt (West Bromwich Albion) after a foul in the penalty area. Corner, West Bromwich Albion. Conceded by Yohan Cabaye. James Chester (West Bromwich Albion) wins a free kick in the defensive half. Attempt saved. Yannick Bolasie (Crystal Palace) right footed shot from outside the box is saved in the centre of the goal. Assisted by Yohan Cabaye. Hand ball by Fraizer Campbell (Crystal Palace). Substitution, West Bromwich Albion. Callum McManaman replaces James Morrison because of an injury. Goal! Crystal Palace 1, West Bromwich Albion 0. Yannick Bolasie (Crystal Palace) header from very close range to the bottom right corner. Assisted by Yohan Cabaye with a cross following a corner. Corner, Crystal Palace. Conceded by James McClean. Delay in match James Morrison (West Bromwich Albion) because of an injury. Attempt missed. Yohan Cabaye (Crystal Palace) right footed shot from outside the box misses to the left following a corner. Corner, Crystal Palace. Conceded by Chris Brunt. Attempt saved. James McClean (West Bromwich Albion) left footed shot from outside the box is saved in the bottom right corner.